I recently purchased new power steering hoses. The pressure side of the steering assembly is plumbed by two hoses that form a “U”. The hoses allow for the flex between the steering box which is mounted to the frame and the power steering pump which is mounted to the motor. It’s usually an easy job. I’ve replaced the hoses once before. You get a little oily but over all it is not that bad. This time was different. I got the old leaky hose off and was ready to put the new hose on. I lined it up and wrenched it down, or so I thought. I filled the reservoir and watched the power steering fluid pour out and thankfully into a pan I had down. I was pretty upset about this. First it was messy and second that fluid ain’t cheap. I took the hose off and began to investigate. I looked at the fitting and as sure as rust will find you Land Rover, it was cross threaded. I tried to thread it again but it was a no go. I tried filing the fitting’s thread so they would turn with out cross threading but it wasn’t going to work. I figured I would need to tap the hole and to do that the steering box would have to come out. I was not excited about that, but JagGuy confirmed it. I would have to pull the steering box. 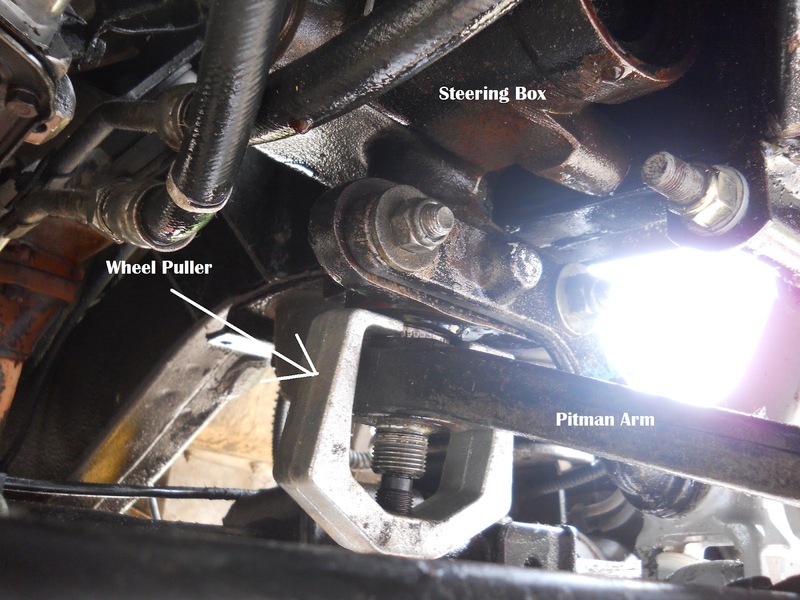 There are a few things that need to come out before you can pull the steering box. You have to pull the shock tower and the steering shaft off. To pull the steering box off you have four bolts that mount the shock tower to the frame. I removed the shock and then pulled the bolts for the shock tower. I should have left them in place because the steering shaft was difficult to remove with the steering box moving all around. I pulled the rest of the low pressure setting hoses because they were in the way. You have to also pull the pitman arm. This takes a wheel puller. Looking from the wheel well. Looking from the front to the back. This is a brutal tool and it releases a lot of energy when the pressed in wheel comes free. With everything disconnected I wrestled the steering box out. I have it out and on the work bench. I attempted to thread the spare hose in the jacked up hole. It is really jacked up. It will have to be tapped out or (audible gasp) replaced. It costs 549.95$(US) from Atlantic British.com. Maybe after 193,000 miles I might need a new steering box. But I’m hoping this steering box will be able to be sorted out. Like all things Land Rover…if you start working on something and things go wrong. You will experience more things that go wrong. This time I have a broken shock mount on the frame. How does this kind of thing break? That is gonna have to be patched. I’m not sure if welding it as it is will fix it sufficiently. I’m thinking a rather large washer welded in place. Perhaps I’ll have the crack welded and a washer added and welded in place as well. So I need to find a set of taps. Perhaps I should take the steering box to a machine shop and ask them to tap it for me. This might be the most expedient way to get it fixed. I was surprised a how little rust there was. If you think about how much steering fluid has been leaking under there it would be nearly impossible for rust to form. There was some rust on the shocks but they seem to be working still. I’m pretty sure they could be replaced by now, they’ve been on the truck for 10 years. I need springs too but that will have to wait until I can steer again. UPDATE: I’ve done some Googling and found a rebuilt steering box for 265$(US) from Car Steering Wholesale. This entry was posted in power steering, steering leak. Bookmark the permalink.